A cloud-based database of UK geological and geotechnical data and 3D ground models could soon become a reality, thanks to new research led by geotechnical data company Keynetix and the British Geological Survey (BGS). The two year, £540,000 BIM for the subsurface project is funded by Innovate UK under its Digitising the Construction Industry initiative. As well as Keynetix and BGS, the project team includes consultant Atkins and Building Information Modelling (BIM) pioneer Autodesk. Keynetix technical director Gary Morin, who is leading the research team, added: “Unforeseen ground conditions continue to be a major cause of project delays and construction programme overruns. “A big problem is the limited availability of high quality geotechnical data, which is stored mainly in project archives. If this was publically-available, construction teams could access better data, site investigations would be more focused and ground risk reduced, saving time and money. According to Morin, one of the biggest sticking points of incorporating geotechnical data in BIM is that many geotechnical teams are reluctant to share interpreted data with the wider project team, because they are worried it will be misused. Results of the research are scheduled to be published in 2017 but the research team expects to release regular updates as the work progresses. This entry was posted in Uncategorized on June 26, 2015 by rumbelom. The Construct15 event next month is shaping up to be the biggest undertaking of its kind, uniting professionals and academics in the fields of Construction, Manufacturing, Resources, Technology and BIM like never before. But dont take our word for is, below is the welcome message from the Construct15 chairs, the esteemed Mr Martijn Truijens and Professor Xiangyu Wang. The IGLC conference is the world’s leading conference on advances in construction practices, innovative technologies and first class research. The theme for Construct15 is “Global Knowledge – Global Solutions” which reflects the importance of shared knowledge for industry improvement. It is clear that the global construction industry is fast-changing, driven by changes to the world economic environment and demographic growth. In order to deliver value and maintain competitiveness, the construction industry will need to develop its capabilities for managing innovation and technical changes to construction practices. 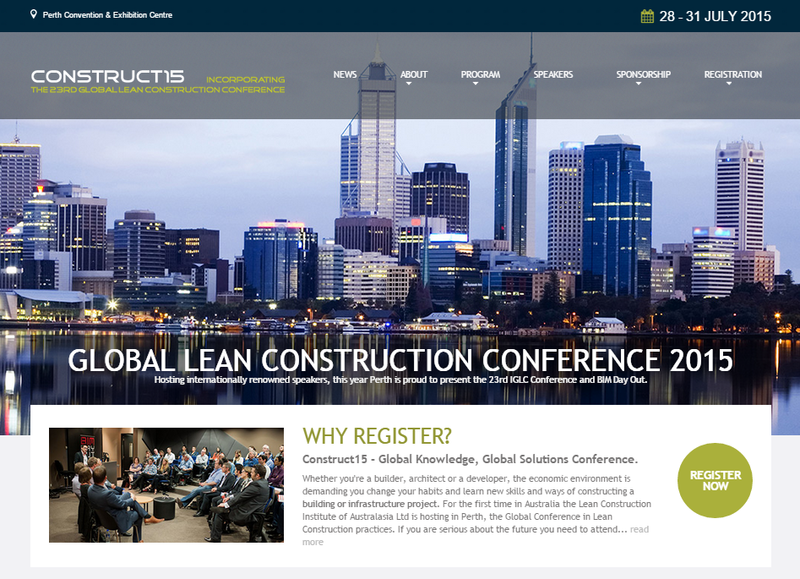 Over four days Construct15 will bring together the best of world lean construction experts and practitioners. Through presentations of best practices, key leader panel discussions, significant case studies, workshops, professional and academic papers, and product demonstrations, you will have an exceptional opportunity to share in how construction professionals are addressing the major challenges confronting the construction industry. In addition you will have invaluable networking opportunities with key leaders from the global construction industry, be able to strengthen existing relationships with colleagues from our industry and meet new acquaintances. This will be complemented by a variety of social events including a Welcome Reception and Conference Dinner. We are proud to host this International Conference here in Perth, Western Australia. This honour highlights the significance of Western Australia – the construction and mining hub of Australia, in the global construction market, and is acknowledgement of The Lean Construction Institute Australasia and the leadership role it provides in the Australasian construction sectors. This entry was posted in Uncategorized on June 19, 2015 by rumbelom. The BIM Day Out just got BIGGER and BETTER! The worst kept secret in BIM is OUT! The BIM Day Out 2015 is now part of CONSTRUCT15!! More BIM and BANGS (and BEERs) for your BUCKs! Yes, Its true. The worst kept BIM secret is finally out. The BIM Day Out guys are teaming up with LCIA, IPC and LCIA to be part of the one in a life-time extravaganza which is Construct15! This entry was posted in Uncategorized on June 18, 2015 by rumbelom. 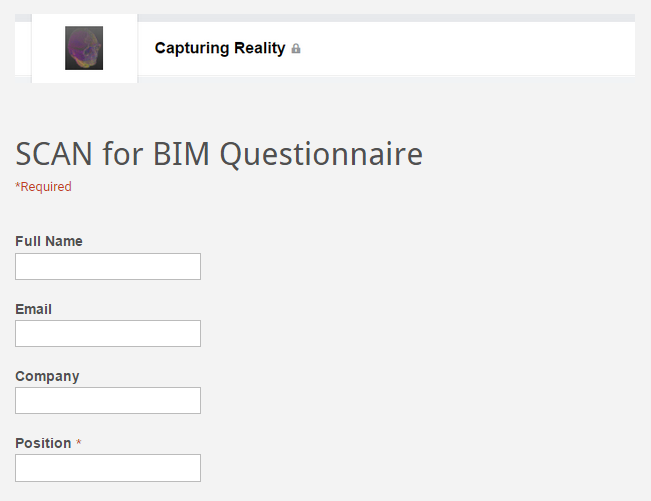 I have been asked to post a questionnaire for the Scan for BIM / Scan to BIM market on behalf of a large vendor. For followers of the “Capturing Reality” Linkedin Group, I will be posting a collation of the results. The responses to the questionnaire can be anonymous if you like, but we do require at least a position and a country/region. Thanks for your time if you can take a moment to respond. This entry was posted in BIM Collaboration, BIM Software, BIM Standards, Industry Event on June 17, 2015 by rumbelom. From BIMbo to BIMinion: Bel gets her BIMcrunch moment. Very very proud to have Bel-BIM-Devo featured the lastest BIMcrunch article. Well deserved! BIM Brunch is the perfect accompaniment to your dinner break. Featuring some major players from the #GlobalBIMCrew,BIM Brunch is an interview feature where industry specialists talk about their passion for Building Information Modelling. Taking part today is Australian professional Belinda Thompson, Western Australia BIM Coordinator for GHD Woodhead. Belinda tells all about the favourite project team she has worked with, the close collaboration she shares with her colleagues, the rewarding nature of educating other staff, and swapping dental nursing for architecture! I have a couple that I love to read. The Midnight Lunch by Ceilidh Higgins is a great blog. What Revit Wants by Luke Johnson,Mystical BIM by Jasper Wong and also Practical BIM by Anthony McPhee are great too. The B1M website is wonderful as well. Do you have a favourite industry book, magazine or publication? The B1M Mail as an industry publication is fantastic. I also do like to get my hands on the Mastering Autodesk Revit Architecturebooks each year. @LukeJohnston81, @BIMinions, @bondbryanBIM, @Twiceroadsfool, @Steve_Stafford, @earthcruiser13 and @BIMcrunch just to name a few! I think that there is no favourite project as such but favourite teams of people that I have worked with. One of the most interesting projects would be the Perth Underground Bus Port. The Bus Port went through many design iterations which challenged the coordination efforts of the BIM team. Thankfully it is now currently under construction and expected to be finished well ahead of schedule. What is the best thing about the team at GHD and GHD Woodhead? The best thing about GHD and now also GHD Woodhead, which is our Architecture, Interior Design, Landscape Architecture, Planning and Urban Design division, is that we all work closely together. For Instance, the benefits from having the Building Services and Structural teams sitting on the same floor as the Architectural side of things means that communication and education is friendly and easy. The same applies for all disciplines, if someone needs to ask a question about Oil and Gas, Water Technology, Surveying, Roads and Transport etc., then we have the resources within the one building to provide the answers. The first ‘real’ BIM project was a hospital project that I inherited at the Tender stage. There were many lessons learnt, especially when tackling a project that is as far along as this one was. The most important lesson learnt would be that overly complex wordy BIM Execution and Management plans are useless because people will just ignore them. Better functionally designed buildings that are truly fit for purpose whilst offering time, energy and cost savings during the entire buildings life cycle. I always had an interest in architecture so when I had the chance to change careers (I was a dental nurse for about 4 years) and to go back and study I grabbed the chance with both hands. I believe that the interest started because my father was in the structural and civil engineering industry, specifically involved with bridge design. Becoming Studio BIM Manager at Woodhead. Educating other staff. I love fostering excitement in other staff members as to what can be achieved with BIM and how we can streamline what we do, making everything more efficient without losing the overall design of a building. To learn more about Belinda and GHD Woodhead, follow them both on Twitter. You can do so by clicking their aforementioned names. This entry was posted in Uncategorized on June 16, 2015 by rumbelom.